When I started in this industry, almost 20 years ago, my very first case involved a lumbar disc injury with a subsequent discectomy and fusion surgery. Since that first case, I've probably worked on hundreds if not thousands of similar cases. Any medical illustrator who works for attorneys will probably agree that intervertebral disc cases are the most common projects we receive. If you've been handling personal injury or medical malpractice cases for a while you've probably seen more than a few disc cases yourself. Thankfully, new developments in the sciences of disc injury and surgical techniques have kept this topic from getting stale. Where once we saw fixation accomplished with things like Harrington rods or Cotrel-Debousset instrumentation that could easily be confused with medieval torture devices, we now see pedicle screw fusion hardware, and even percutaneous discectomy procedures that do not require large open incisions. While once there were only different shapes of harvested bone grafts, there is now a variety of titanium and synthetic cages or spacers that can be employed to replace an offending disc. Today, I'd like to discuss spinal discogenic pain. 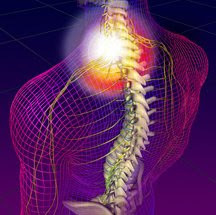 Discogenic pain is pain that comes from the disc itself. Although some medical experts have been discussing the issue for years, it is a fairly groundbreaking concept that is relatively new in our industry. This is not just the standard discussion of disc bulges and disc herniations that can compress the adjacent nerves, but rather a discussion of the pain that comes from the disc itself when it is damaged. Traditionally, many experts discounted intervertebral disc cases that showed clear evidence of disc injury if there was not also evidence of spinal cord or nerve root compression. Their rationale was that nerves generate and transmit pain, therefore if there is no compression of a nerve then there can not be real pain. However, it is now becoming clear that there are at least two ways that pain can originate from an injured disc that does not involve direct compression of the spinal cord or nerve roots. The first mechanism of discogenic pain involves the recurrent meningeal nerves. These nerves branches off of the ventral rami of the nerve roots outside of the spinal canal and then course back in through the neural foramen to innervate the posterior annulus of the discs as well as the posterior longitudinal ligament. These nerves sense when the annulus or posterior longitudinal ligament is stretched, strained or torn. Nerve impulses then flow through the recurrent meningeal nerve, through the nerve root, up the spinal cord and into the brain to stimulate the pain centers. Injuries to the discs are no different than injuries to the fingers, toes or any other part of the body. Pain originates wherever there are nerves to transmit sensory impulses from damaged tissue. The second mechanism discussed in recent literature concerns the caustic effects of the fluid normally contained within an intervertebral disc. 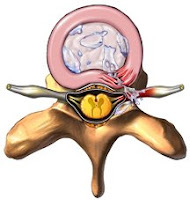 When the annulus of the disc is torn, fluid from within the disc may leak out into the spinal canal (passageway of spinal cord) or neural foramen (passageway of nerve roots). This fluid contains inflammatory cytokines, chemicals that have an inflammatory effect. Inflammatory cytokines act as a strong irritant causing severe inflammation and pain. Recent studies on rats show that chemicals extracted from the nucleus of a damaged intervertebral disc which results in the rat walking with a limp, implying that the rat is experiencing pain. Also, when these chemicals come into contact with a nerve root, it can cause typical radiculopathy, paresthesia, weakness, and sensory and motor loss symptoms even though the MRI may show no nerve root impingent at all. It is believed that this inflammation is helpful in the reabsorption and healing of a herniated disc, but these same chemicals can have a harmful effect on the adjacent nerve roots. This is one explanation why a patient who's herniation may appear to have healed on a subsequent MRI may still be experiencing significant symptoms. I mention all this as a means of illustrating that new science is constantly bringing forth new questions and new answers in all areas, even those we think we have seen a thousand times before. It is vital that we continue to keep abreast of new theories and new discoveries to be sure that we are utilizing the best tools at hand to understand the subtleties of the issues in each case. I will continue to try to keep you informed of some of these issues through this forum in the weeks and months ahead. I have received an inordinate number of calls this week from attorneys with rotator cuff injury cases or medical malpractice cases involving arthroscopic shoulder repairs. Regretfully, many of these conversations have reinforced my opinion that the shoulder is one of the most widely misunderstood areas of anatomy that is frequently involved in litigation. To many attorneys this ball and socket joint seems like a confusing mass of tendons and skeletal structures with functions that are difficult to recognize and names that are hard to pronounce. It certainly doesn’t need to be that hard. I’ll take just a few minutes to provide a basic overview of the anatomy of the shoulder so that you’ll be better prepared in your next personal injury or medial malpractice case. In my opinion, the key to understanding the entire shoulder is a thorough understanding of the scapula (shoulder blade). The scapula is a fairly flat triangular shaped bone located on the upper outer portion of the back. The back of the scapula is divided by a ridge called the spine that we will be important to remember later when we discuss the rotator cuff. You should also note the two small projections or processes that protrude from the scapula. 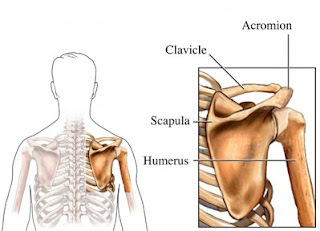 The tip of the spine becomes the acromion process projecting upward which articulates with the clavicle (collar bone). 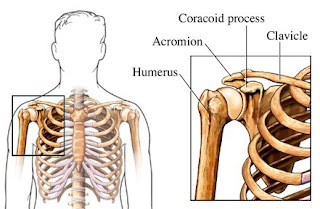 Also there is the coracoid process that projects forward. 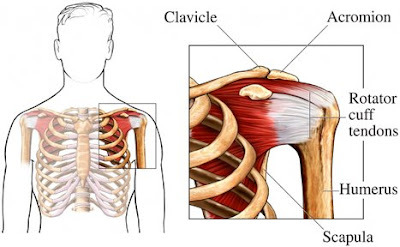 Both of these processes provide attachments to various muscles of the chest and arm. The final skeletal aspect of the scapula that you need to appreciate is the glenoid cavity that forms the socket portion of the ball and socket joint of the shoulder. The rotator cuff is a group of four muscles that that extend from the scapula to the humerus (upper arm bone) to provide stability and prevent dislocation. The first three of these muscles are named in association with where they lie in relation to the scapula. Now that you appreciate the skeletal anatomy of the scapula, you will better understand these names. The supraspinatus runs along the top of the scapula above the spine. The infraspinatus runs along the back of the scapula beneath the spine. The subscapularis runs beneath the scapula. There is also the teres minor which runs on the back of the scapula at the very bottom. Any or all of these muscles or the tendons that connect them to the humerus can be injured, but in my experience, the supraspinatus is by far the most commonly injured. One reason for the vulnerability of the supraspinatus is that it runs beneath the acromioclavicular joint where the clavicle joins the acromion process. Injury to either surface of this joint can cause bone spurs that protrude down leading to tearing of the underlying supraspinatus tendon. Of course there are other aspects of the shoulder that I haven’t discussed here such as the glenoid labrum, the subacromial bursa, the vessels of the thoracic outlet or the nerves of the brachial plexus. Perhaps we will return to the shoulder in future articles and explore this wonderfully complex joint in greater detail. Since its introduction in the late 1980s, laparoscopic cholecystectomy has become the treatment of choice for symptomatic gallstone disease. Today more than 75% of cholecystectomies are performed laparoscopically. By choosing laparoscopic cholecystectomy vs. open cholecystectomy , the patient can achieve a better cosmetic result with less scarring, a faster recovery with return to normal activity and a shorter hospital stay. 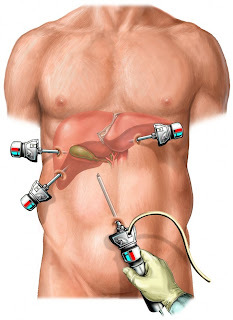 Regretfully, there are a variety of laparoscopic cholecystectomy complications. These complications include bowel perforation, infection, hemorrhage and burns, but for the purposes of this article we will concentrate on the most serious complication: bile duct injury. The incidence of bile duct injury during laparoscopic cholecystectomy has decreased but remains as high as 1.4%. During this discussion I hope to offer an overview of the pertinent anatomy, a description of the surgical procedure and a discussion of the complications and most common surgical repairs. The gallbladder is a pear-shaped sac that is attached to the bottom surface of the liver. It stores bile between meals, concentrates the bile by reabsorbing water and releases the bile when needed to help the body digest fatty foods. 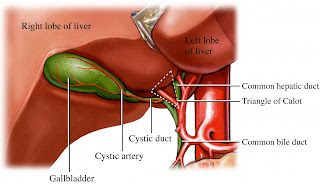 Bile is carried from the liver and gallbladder to the small intestine via the bile ducts. The largest of these ducts is the common bile duct. This duct is formed by a joining of the common hepatic duct that leads down from the liver and the cystic duct that leads from the gallbladder. The common bile duct is vitally important since it is the only pathway through which bile can travel from the liver to the intestines. A laparoscopic cholecystectomy is the surgical removal of the gallbladder that does not require a large open abdominal incision. Several small openings are created with sharp instruments called trocars. A laparoscope and other surgical instruments are inserted through these openings and controlled via a view through the scope. The scope is often assisted by a small video camera mounted in the scope. The procedure is relatively straightforward. The cystic duct and cystic artery leading to the gallbladder must be clipped and divided, the gallbladder dissected free from the liver and then the gallbladder can be removed. But it is vitally important that the surgeon properly identify the cystic duct prior to the clipping or division of the bile duct. Mistakes in the identification of the bile ducts can often lead to injury to the common hepatic duct or common bile duct. These injuries include excision, division, narrowing and occlusion of these structures. Narrowing or occlusion of the bile ducts can lead to a back up of bile leading to damage to the liver. Excision or division of the bile ducts results in leakage of bile into the abdominal cavity leading to widespread infection and peritonitis. This can damage multiple organs and even result in fatal sepsis. Complications are generally minimal if the errors are realized during surgery or recognized promptly. The most serious cases generally involve delays or failure to diagnose the complications. Treatment of intra-operative bile duct injuries often involves a complex open procedure called a hepaticojejunostomy (or Roux-en-Y) in which a loop of small intestine is divided and pulled up to the liver where the small bowel is connected directly with the damaged bile duct. This procedure is much more involved than the original laparoscopic cholecystectomy procedure and results in all of the post-operative negatives that the laparoscopic technique had attempted to avoid. These negatives include pain, scarring, extended hospital stay and prolonged recovery. In worse cases, continued complications can result in multiple surgeries, progressive deterioration and even death. Even in the best cases, patients experiencing iatrogenic bile duct injuries will experience a decreased quality of life moving forward.